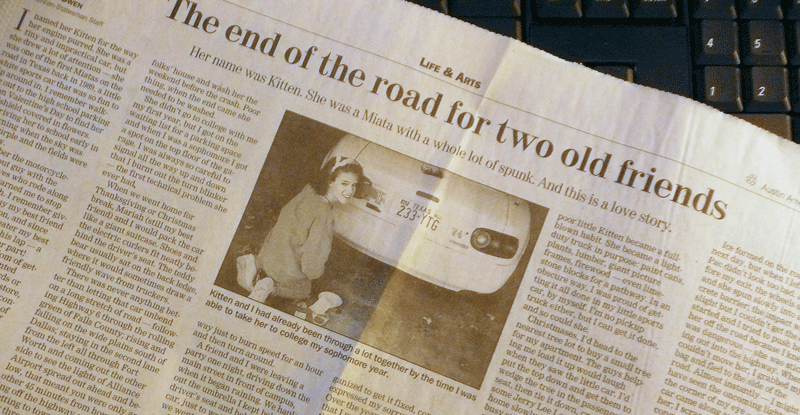 Awhile back the paper was kind enough to run the obituary I wrote for my car. Now I blush at my writing, which came out in a fit of grief, but the flaws are all mine and nothing to do with Brad Buchholz, who is a wonderful writer and a tender soul and who much to my astonishment championed this piece, encouraged me and edited out many of the worst parts. Love you, Brad. I named her Kitten for the way her engine purred. She was a tiny and impractical car, but she drew a lot of attention – she was one of the first Miatas on the road in Texas back in 1989, a little white sports car that was so fun to zip around in. I remember walking out to the high school parking lot on Valentine’s Day to find her windshield covered in flowers. And driving her to school early in the morning when the sky was barely purple and the fields were misty gray. I remember the motorcycle-riding dropout guy with the bright blue eyes who rode along with me and warned me to stop riding the clutch. I remember giving a lift to the guy my best friend and I had a crush on, and since the car was a two-seater my best friend had to ride in his lap – a valiant sacrifice on her part! I remember the freedom of getting to go wherever I wanted to around town, to buy records or sell books at the half-price store, or to the movies. I’d put the convertible top down in the dead of winter just for the sheer hell of driving with the freezing wind battening my face. I remember racing around my neighborhood and the back roads south of town in the dark of night. Once I was stupid enough to outrun a police officer by ducking down the first street – he must have let me go. I remember finding a lane of arching trees one afternoon out in the country and always intending to go back. The sunny afternoon of New Year’s Day 1990 I spent in the driveway of our house polishing the snowy white paint, listening to the radio count down the best of the ’80s, Mom bringing me a glass of iced tea. Over the years I spent a lot of afternoons that way, in apartment parking lots, in driveways and behind college dorms, rubbing imperfections out of the paint, scrubbing yellow oak pollen off the ragtop. I had planned to drive to my folks’ house and wash her the weekend before the crash. Poor thing, when the end came she needed to be washed. She didn’t go to college with me my first year, but I got on the waiting list for a parking space and when I was a sophomore I got a spot on the top floor of the garage. I was always so careful to signal all the way up and down that I burnt out the turn blinker – the first technical problem she ever had. When we went home for Thanksgiving or Christmas, Mariah (still my best friend) and I would pack the car like a giant suitcase. Shoes and the electric curlers fit neatly behind the driver’s seat. The teddy bear usually sat on the back ledge, where it would sometimes draw a friendly wave from truckers. There was never anything better than letting that car unbend on a long stretch of road – following Highway 6 through the rolling green of Falls County; rising and falling on the wide plains south of Dallas; staying in the second lane from the left all the way through Fort Worth and coming out the other side to see the lights of Alliance Airport spread out ahead and below, that meant you were only another 45 minutes from home; turning off the highway even before getting to town for the joy of winding through the country roads like a native who knows all the quickest routes to end up at the back door of home. Every time I climbed in, I felt she understood me, in the way a horse gets to know its rider’s good and bad habits. We’d been through so much together. And she meant independence to me: No matter what happened, I could always get in my sturdy little car and drive off and I would be fine. We prowled through the streets south of campus listening to U2 sing “One” as I tried to get over some guy. We hopped on the highway just to burn speed for an hour and then turn around. A friend and I were leaving a party one night, driving down the main street in front of campus, when it began raining. We hauled out the umbrella I kept behind the driver’s seat and held it over the car, just to watch people laugh as we went past. I remember pulling up to a stoplight in Bryan on empty streets in the middle of the night and having my boyfriend draw me over to him and kiss me until well after the light turned green. And driving home from Christmas shopping at the mall in the early dark of winter, in soft, soaking rain, with lights shining on the wet streets and in the drops on the windshield. I remember taking the long way around campus just to enjoy driving her past everyone. Once, a friend accidentally pulled her car into Kitten’s side as she was backing out of the driveway. It took awhile to get the dents repaired and my self-esteem was not doing too well around that time, so the whole thing, like a lot of college experiences, turned into a bad poem. Driving around with my dear car dinged up, too disorganized to get it fixed, completely expressed my sorry state of mind. Over the years, it always seemed that I was happiest when I took the best care of her, and that when I let things go and felt guilty for not caring for her properly, everything else was bad too. But when she was in fine form, she could cure any rotten mood I was in. I made driving tape after driving tape. I kept jumper cables in the trunk and maps in the glovebox. We traveled light and we were always ready to go. I meant to keep her forever. She would be there when I got a job, got married; she might have to be the secondary car when I had kids, but she would still be there in the garage, and she would have earned a little rest after so many years of daily duty. When I moved to Austin she mostly got stuck taking me to work and back. Trips to visit Mariah back in College Station let her stretch her legs, and we collected a couple of speeding tickets (don’t go through Dime Box in a hurry). After I bought a condo, my penchant for hauling bizarre stuff in poor little Kitten became a full-blown habit. She became a light-duty truck in purpose: paint cans, plants, lumber, giant picture frames, firewood – even limestone blocks for a pathway. In an obscure way, I was proud of getting it all done in my little sports car, by myself. I’m no pickup truck, either, but I could get it done, and so could she. Christmases, I’d head to the nearest tree lot to buy a small tree for my apartment. The guys helping me load it up would laugh when they saw the little car. I’d put the top down and get them to wedge the tree in the passenger seat, then tie it down, crank up some Jerry Lee Lewis and wend home slowly through the least-busy streets – a one-car holiday parade. Part of the deal, of course, was cleaning her up afterward. I got her upholstery shampooed a year and a half ago so she’d be all neat and clean for Mariah and me to drive to Houston for a friend’s wedding. That was our last road trip together – all three of us, I mean, Kitten and Mariah and I. We had to pack the car like old times, and we spread our bridesmaids’ dresses on the ledge behind the seats so they wouldn’t get wrinkled. Mariah’s always in charge of the music, and we sang along with Sam Cooke and did our little dances (“Lean up! … Lean back! … Watusi!”). When we loaded up to drive back the morning after the wedding, we were given leftover bottles of wine from the reception, and they clanked together on Kitten’s floorboards all the way home. The morning before the wreck, it was very cold and her battery wouldn’t start; I remember sitting there cranking the engine, looking at her odometer, which read 79,900 and change, and thinking “Maybe this is it, maybe that’s as far as she goes.” I knew the car was getting older. I just always thought I could fix what was wrong. Ice formed on the roads late the next day, but when I left work MoPac didn’t look too bad. Just before my exit, the wheels slipped and she spun slowly into a concrete barrier; the impact was slight but I couldn’t get her started again and I tried to push her, get her off the road because I knew it was dangerous – she was sticking out into the highway. When I couldn’t move her, I grabbed my bag and fled to the side of the road. Almost instantly – I might have seen the oncoming lights in the corner of my eye – the second car came along and smashed into her; I scrambled partway down a concrete slope away from the spinning cars as they came toward me.I’m so grateful neither the other driver or I was hurt. Another driver stopped to help, and as we stood on the median watching, three more vehicles hit the same patch of ice and spun into the guard rail on the other side of the road. So many more people could have been hurt; the other cars could have spun toward us, where there was no rail; the police arrived fast and blockaded the road. So much to be thankful for. Still, it hurts to dwell on my final view of her, crunched up in that wrecker yard. I don’t want to think about her in terms of parts: the steering wheel that barely anyone but me has ever touched; the gear shift with its plastic housing that snapped slightly out of alignment long ago, which I used to fitfully pop back together and apart when stuck in traffic; the weird two-piece sun visors they only put on the first models. The last time I touched my car was when she was pulled up on the tow truck — I reached in to turn off the headlights because I saw the battery dying. I still hoped to fix her. Maybe I knew, because even though the wrecker driver was standing there, I did the most ridiculous thing: I planted a swift little kiss on her ragtop.